Denne lille studie behageligt for to personer er placeret på den samme gade i Michelangelos David. Det er på få minutters gåafstand fra middelalderen og renæssance mesterværker af området downtown: Domkirken med Brunelleschis Dome, Palazzo Vecchio og Loggia dei Lanzi i Signoria Square, Uffizi Palace, som vært for en af ​​de vigtigste museum i verden, Churche San Lorenzo. Der er meget få steder i verden, hvor så mange mesterværker og natur skønheder er samlet sammen. Studiet er lyse og rolige, og det er på 4. øverste etage i en bygning med elevator og porter. Den forreste del af bygningen bevarer sin gamle aspekt. Lejligheden har privat opvarmning, aircondition, video hus telefon, satellit-tv og pansrede indgangsdøren. Det har en hal-rum, et tekøkken med elektriske ovne, et komfortabelt badeværelse med bruser og en lille pulterrum. Gulvet er et oliventræ parket. Sengen er en komfortabel dobbelt én og dets størrelser er cm 165 x 190. Internetopkobling ti meter langt. Meget behagelig lift, velegnet til kørestole og klapvogne. På forespørgsel feltseng til babyer (cm 115x60) gratis. Correct et propre ,mais très bruyant .Isolation phonique faible surtout avec l'exterieur. Many thanks for your reviw, I hope that you enjoyed Florence and your stay in the apartment. 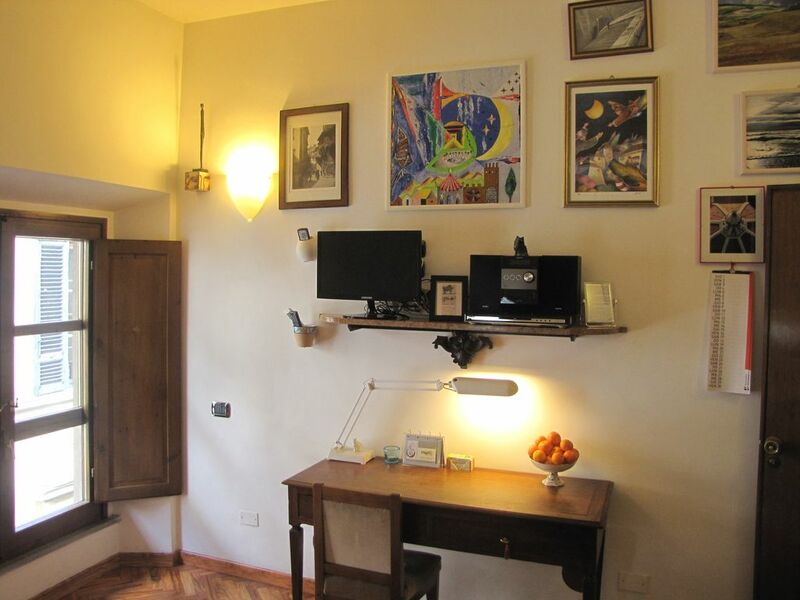 The studio is located in the pedestrian area of Florence and therefore no trafic at all. The noise could be people speaking and walking along Via Ricasoli (where the David of Michelangelo is), if you are not a used to this, perhaps it could disturb somebody. I loved staying here, I felt like a real local and it was a well needed rest for me to not have to hassle with public transport, I could just walk to everything: restaurants, grocery store and shops. The owners were fantastic, they even came to pick me up at the bus which arrived after midnight on a bitterly cold night and they escorted me to the apartment to make sure I arrived safely. That was very generous of them and kind. I enjoyed using the little kitchen too as I like to cook and make simple meals. It was a very relaxing stay and even quiet at night for being in the historic center. Loved the church bells ringing in the distance from the Duomo a few times a day. It was romantic. A wonderful pied-a-terre in a beaufiul city! We had no trouble finding the street, walking from the station. Enzo's son Luigi was there to meet us and was very friendly and helpful. The studio is compact but has everything one would need, and the bathroom is surprisingly large. We appreciated the free bubbles and lollies - what a nice 'extra'! The location of the apartment is fantastic - you can see the Duomo from the window - and it was easy to walk everywhere in Florence. The Accademia is further up the same street and is a must. We didn't get to all of the things on our 'must do' list - there were just too many of them - but we will be back! We can recommend Buca Niccolini, just down the road, for great food and excellent service... Enjoy! This is the perfect area to stay in Florence. The apartment is a good size for 1-2 people and has all the amenities you will need. Located just steps from Duomo and many restaurants. Grocery stores are within easy walking distance as are museums and all tourist sights including David. The apartment is safe and secure. The host is always available by phone. And the price was very good. The only drawback was the lack of wifi. The Internet is essential for booking skip the line tickets or downloading maps. It was inconvenient not having access. The facilities of our studio are clearly listed in the description of the studio in the website and wifi is not listed. It is of course better to have free of charge internet connection at disposal but you have rented an apartment without wifi. Guests must understand that internet or wifi connection has a cost which is not so low for budget accommodation like our one. We want to maintain the fee affordable for everybody and, on the other hand, wifi is easily available in most coffee bars, ice-cream shops, museums, public library few steps away from the studio. In any case, we are now verifying some new wifi offers and we hope to obtain one of them without increasing the renting fee. As soon as the studio will be wifi connected we will list this facility in the website. Several studios next to our property have plenty of amenities including wifi and they cost approximately Euro 100 per day: as you prefer! Studiet er velegnet til turister, da de kan nå ud til alle monumenter i få minutter til fods. Fremragende restauranter, butikker, boghandlere, berømte kunstgallerier og antikviteter er meget tæt på. I mellemtiden kan du nyde den varme og livlige atmosfære i San Lorenzo Marked, en Liberty overdækket marked, hvor du kan købe typiske og friske fødevarer. Medici-paladset og San Lorenzo kirken er i samme område. Cykel leje er også muligt. Privat garage i næste kvarter.